The City of Hartsville is now accepting payments online for tickets issued by officers of the Hartsville Police Department. This convenient service will make payments easier for those that wish to conduct business online rather than over the phone, by mail, or in person. The payment portal will accept Mastercard, Visa, Discover, or American Express cards. A small fee applies to each online payment. 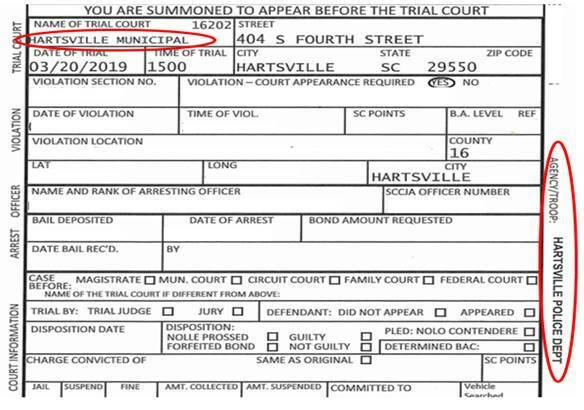 This service only applies to tickets that begin with ticket number 201911 or 7102p, have Hartsville Police Department listed as the Agency/Troop vertically on the right side of the ticket, or have the trial court listed as “Hartsville Municipal”. An example ticket below is highlighted with the areas to be aware of. An example Hartsville Police Department ticket highlighted with the areas to be aware of. The online payment portal may be conveniently found on the City of Hartsville’s website. The City of Hartsville is excited to make this process more convenient for individuals wishing to pay their fines online.